Which crops you are growing determines how the seeds are sown. Some can be direct sown where they are to grow, others are sown in a seed bed and then transplanted to their final growing position, others need to be sown indoors in pots of compost with heat. Fast-maturing crops should be sown little and often to prevent the glut/famine cycle that occurs when long rows are sown in one go. By sowing shorter rows at 10- to 14-day intervals you will harvest just the amount you need over a much longer period. The vast majority of vegetables are grown by sowing the seed directly into the soil where they are to grow. To do this you make a shallow trench (called a drill) with a bamboo cane, hand trowel or corner of a hoe. Sow the seed directly into the drill and coverwith soil that you have lightly firmed down. Always sow evenly and thinly to avoid excessive thinning out of the crop afterwards. Then water the soil after sowing. Some crops, especially leafy brassicas, are sown in a seed bed. Transfer the resulting young plants to their final growing position once they have developed a few true leaves and are large enough to handle. Lift these carefully with a hand fork, firmly replant them and then thoroughly water them in. Most seeds won't germinate below a soil temperature of about 7°C (45°F) so you must delay early sowings until the soil has at least reached this temperature. 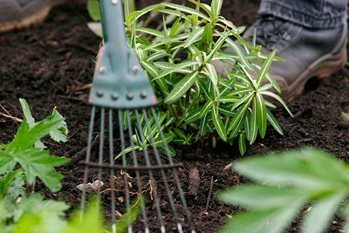 One way to speed this up is to warm the soil by putting cloches, clear plastic sheeting or even bottomless plastic bottles over the soil a few weeks before sowing or planting out. Keep the protection in place over the seeds and plants for a few weeks or until the weather warms up, otherwise the sudden shock of lower temperatures can seriously affect their growth. To provide plants for earlier crops or for tender crops that can't tolerate early spring temperatures, sow seed indoors with heat - preferably in a thermostatically controlled propagator although germinating on a warm windowsill or in a warm conservatory are other possibilities. Once the seeds have germinated the seedlings will need to be kept at a cooler temperature, but a cold greenhouse will normally be too cold - especially at night - for the seedlings to grow on without a check to their growth. You then transplant (prick out) the seedlings individually into small 7.5-9cm (3-3 12 in) pots or cell trays for growing on. Before you plant them outdoors, seedlings will need to be hardened off so that they acclimatise to the temperature. Move the plants to a warm, sheltered position outdoors on a warm, still day and then bring back in at night. Then leave them outdoors all day - either in an open cold frame or covered with fleece. This hardening-off process should take between 10 and 14 days. We have produced a handy vegetable planner to help you decide what to do and when for each crop.